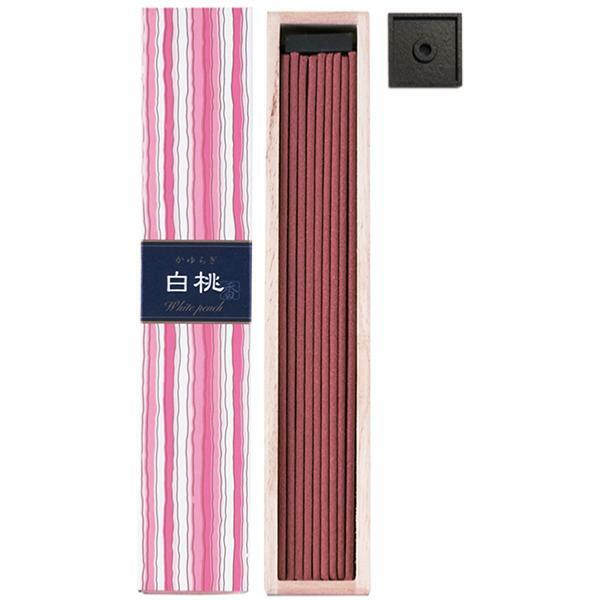 The fresh, sweet and fruity note of White Peach - from the Kayuragi* family of incense from Nippon Kodo. The sticks are packed in a Paulownia wood box, reflecting their superior quality. A small Incense Stick holder is included too. *Kayuragi, where fragrance (Ka) meets with slowly wafting scented smoke (Yuragi). Comfortable fragrance, with calmly wafting scented smoke. This incense creates a moment filled with contentment. Inspired by Kimono fabric, the package texture is smooth, and its colouring is dramatic. Aloeswood, Wisteria, Sandalwood, Pomegranate, Narcissus, Jasmine, Osmanthus, Cherry Blossom, Green Tea, Rose, White Peach, Mikan Orange, Japanese Cypress and Ginger. "Relax your body and mind with Kayuragi, and create a moment of contentment." A juicy sweet floral that fills your room. It has a gentle sweetness to it yet slightly floral.